The MSS100 is a fast, easy way to connect virtually any device with a serial port to a network, so it can be managed remotely. 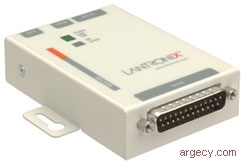 The MSS100 enables you to operate and manage RS-232 serial devices over the LAN, WAN or Internet and replace dedicated PCs and lengthy serial cables with fast and reliable networking technology. This remote access capability increases efficiency, saving you time and money while providing easier management from any browser anywhere, at any time. The included COM Port Redirector software enables Windows applications designed to only communicate though local COM ports to now communicate over to network-enabled devices over Ethernet. The software creates virtual COM ports which are mapped to remotely networked MSS100 units connected to your equipment. This enables you to extend the reach of your devices software applications across the globe. MSS100 includes additional added functionality of complete COM port control when using COM Port Redirector. All hardware pins on the MSS100 can be set and read by the application that opens a "Redirector" COM port. This enables applications that require total COM port functionality to be extended across the network. The MSS100 can be set up locally through its serial port, or remotely using Telnet or a web browser. The included EZWebCon Windows-based configuration software simplifies setup and enables users to easily configure and monitor the MSS100 activity through on-screen menus instead of entering commands at the local prompt. RoHS-compliant, the MSS100 meets Directive 2002/95/EC on the restriction of the use of certain hazardous substances in electrical and electronic equipment.